For a limited-time, Arby's expands their slider selection with the addition of the new Pizza Slider. 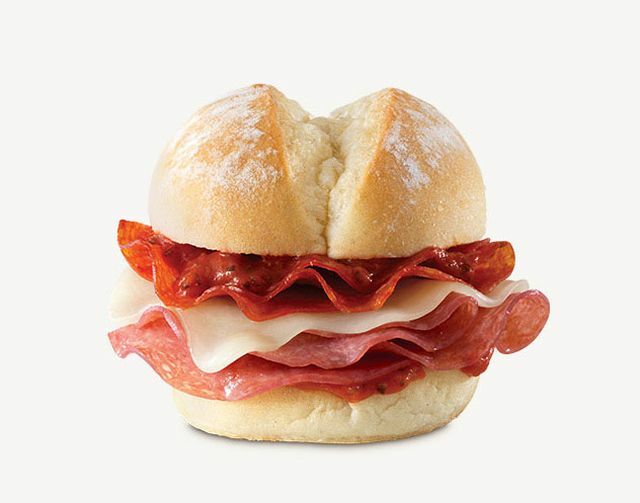 The mini sandwich features Genoa salami, pepperoni, provolone cheese, and marinara sauce on a mini bun. While the Pizza Slider is mostly made of existing menu ingredients, the "Robust" marinara sauce used in the sandwiches appear to be only used for the sliders and is different from the dipping marinara sauce that comes with Arby's mozzarella sticks.